You can imagine a late-era Graham Greene having written the scene, but it’s Tony Gilroy who penned the screenplay instead. Gilroy adroitly uses the civil war-torn era Beirut of the 70’s and early 80’s the same way Greene used WWII blitzkrieg era London (in The End of the Affair) and post-WWII era Vienna (in The Third Man). It’s a cluster **** of diplomatic nightmares, crumbling buildings, intrigue and perils (of both the heart and the body). Prior to the civil war breaking out, Mason, a jovial erudite American political thinker and networker, was the toast of the town, but when a situation involving a terrorist who was responsible for the Munich Olympic murders turns his house into the scene of a deadly shootout, Mason flees Lebanon in heartbreak and despair (turning to drink) only to be sucked back in ten years later when his old friend and former colleague (who stayed on in Beirut) becomes a hostage and Mason is personally requested to negotiate his return. Though Mason’s back-story carries some heavy emotions, none of the other characters are given much weight, and a savvy attaché (Rosamund Pike) would’ve probably been turned into a love interest in Greene’s universe, but Gilroy keeps most of the human interaction clean and in-focus (which isn’t to say there aren’t plenty of opportunities to reveal secret motives and double-crossing). I personally would’ve enjoyed even more melodrama, but I appreciated Gilroy’s effort to keep things modern and on point. 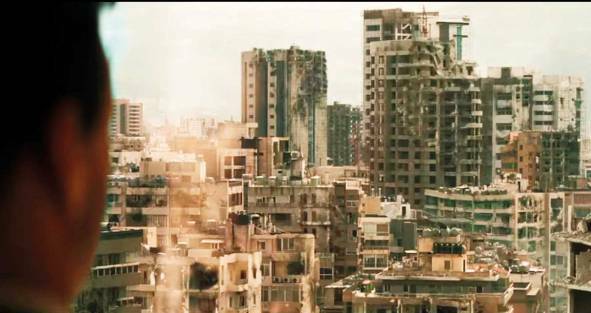 Though inspired by the milieu of revolution and deep infighting that tore apart Lebanon not so long ago, there’s nothing terribly revolutionary on-screen in here in plot or execution. It’s a just lean, occasionally nail-biting, occasionally confusing, genre exercise (ably directed by genre maestro Brad Anderson) that should please fans of Greene, LeCarre, and serials like Homeland. I appreciated Beirut the same way I would a middle tier Greene entertainment, or a middle-shelf whiskey that still hits the spot because it’s ice-cold and on the rocks…expecially refreshing in all that dang heat of the Middle East. This entry was posted in Movie Reviews, Movies, Politics and tagged Beirut, Brad Anderson, Civil War, Graham Greene, Hostage Negotiation, Jon Hamm, Lebanon, Middle East Conflict, Political Thrillers, Rosamund Pike, Terrorism, Tony Gilroy. ← Shhh Will You Please Be A Quiet Place? I liked the fact that Hamm and Pike did not get romantically involved. For me, it made it a little less Hollywood. Good stuff!